Nov. 30, 2018-- This past summer Kyle Seiverd, who teaches biology and environmental sciences at High School North, applied for the FirstEnergy STEM Classroom Grant, which encourages creativity in preschool through grade 12 student learning and teacher professional development in STEM. Early this fall, Kyle and his students discovered he had been awarded a grant for nearly $1,000. His winning project, the Wind Turbine Design Challenge, will have students build their own turbines using everyday classroom resources. The integrated art and science challenge, which will run this May through June, will feature a classroom competition to see which design group will generate the most volts, and students will vote on their favorite turbine design. 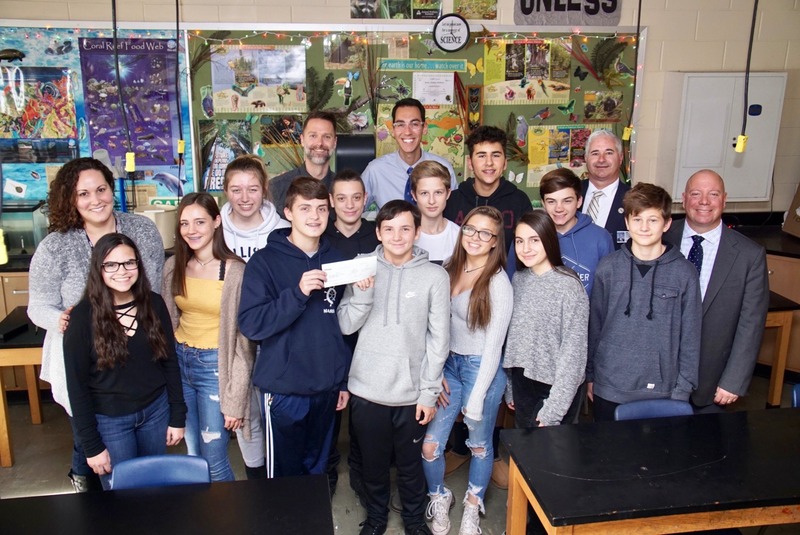 Yesterday a representative from Jersey Central Power & Light (JCP&L), Ashley Whitehead, visited Kyle's classroom to present his grant award check, meet his students, and discover more about the project. Ashley was so impressed by the idea she promised to return this spring with her colleagues to see the project in action.